Hasbro got rid of the boot and replaced it with the T Rex Dinosaur player piece. Hasbro changed its player pieces for Monopoly and added a rubber duck, penguin and of course my favorite change, the T Rex dinosaur. I can't wait for when the game comes out with the new pieces... I will definately buy the new game. I see some T Rex Monopoly pieces that are silver and some that are gold. 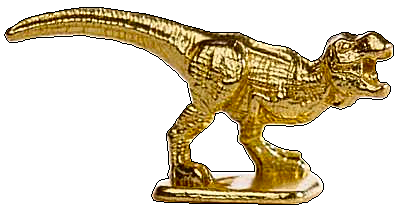 I think the new Monopoly game will come with the silver pieces but I would really like to know how to get the gold T Rex Monopoly piece. I would think that thhis piece would be a collectible item.